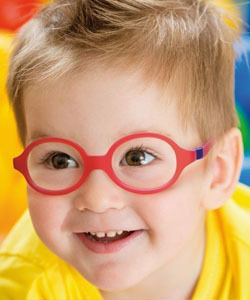 Nanovista Optical makes tough frames for kids that are designed to meet the needs of your active children. All Nano frames adopt the two-in-one concept offering an exchange system for temple or headband wear with one pair of glasses. Manufactured with Siliflex, a patented material that is lightweight (35% lighter than acetate frames), durable and long-lasting and a patented, S2 hinge system, Nano frames are extremely flexible and child-proof so you can forget about breakages and replacements. Manually adaptable temple tips and an adjustable mini-band also improve the fit, comfort and adjustability you want for your child. Nanovista Optical offers four different collections for your precious child: the Nano collection of optical frames made for children from age 4 and up; Nano Baby, frames for children from 0-4; Nanosol, sunwear for children and juniors from 0-15 years; and Nanoglow, a line of frames that glows in the dark. Each line is made with optimal protection, functionality, durability, comfort and fit in mind. Due to their superior design to help children see their best, Nanovista eyewear is highly recommended by eye doctors and eye care professionals.